The summer has come to a close, the traditional wedding season is fizzling out and the dog days of winter are upon us. What does the crew at PPC do in the winter? Well we are very busy in the spring, summer and early fall with tent installs and rental deliveries, but the pace of production doesn’t let up come late fall and winter. During our “Off Season” we are nearly as busy cleaning, inspecting, maintaining and repairing any and all equipment in our inventory. We service, count and purchase new equipment to fulfill needs we’ve established over the past rental season. Maintenance of our equipment is crucial to meeting our clients’ expectations that we provide clean, quality party rental equipment at a competitive rate. The chill is in the air and harvest season is upon us. So why not get in touch with your inner character and throw that Halloween party you’ve always wanted to have. This is one of the few times in a year we get to let ourselves escape into a world of fun and imagination, if only for an evening. So, create a space as spooky or fun as you desire in a tent. You can rent dance floors, sound systems, tables, chairs and food service items to add to your party. We all know this holiday is supposed to be for the children and we have tables and chairs to fit the little ones too. So, go get your candy bowls, costumes and decorations out and have a Happy Halloween! A tent is a canopy, but a canopy isn’t a tent! People use the terms interchangeably, but in the industry we consider a canopy a cover that provides shelter, but to make it a tent you need to add sidewalls! Canopies work fine most of the time, and are preferred, but what about when the weather comes up? Wind, rain, sun and cold can be a hindrance to any event. Sidewall options are available for you to create a controlled, comfortable space for your festivities. They come in various heights, lengths and styles. Your sidewalls should be matched to your tents height and fit properly. Sidewalls can be added to any or all walls as you see fit, but don’t forget your access. Your tent installer can secure the bottom of your sidewalls with stakes or a cable system to keep the sidewall in place. Unsecure sidewalls can be hazardous and will fly around in windy conditions. The most cost effective sidewalls are “Solid” white and are used to enclose, inexpensively, or hide some thing unsightly from view. You can retain a view with “Clear” sidewalls but still have a wind buffer while maintaining an outdoor feel. “French window‘ sidewalls typically have a simulated segmented window panes with square or arched window shapes. They offer a “peekaboo view” inside a tent which can draw interest and has a more elegant look. 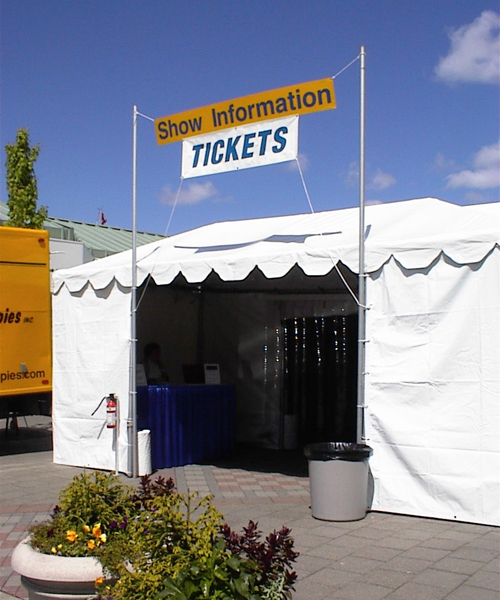 Sidewall styles can be mixed and matched as needed for your tent, event and site. Your event rental professional should have options for you to consider. There is a multitude of options for where you might set up a tent for your wedding day from a park to a parking lot. However, not all tents are suited for all potential set-up locations. There are two distinctly different tent types; Frame and Pole and each has it’s pro’s and con’s. If you have chosen a site that has hard surfaces, limited space or needs to be abutted to a building or another tent, you’ll want to use a “Frame” tent. 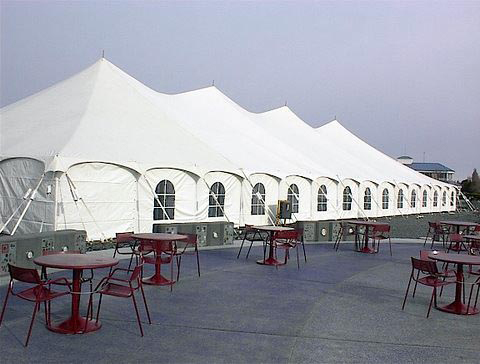 Frame tent consists of an aluminum framework constructed in the prescribed dimensions and then the vinyl (skin) is pulled over the frame work and secured to it. Frame tents can be adapted more easily to fit a restricted site, un-level or multi-level sites. 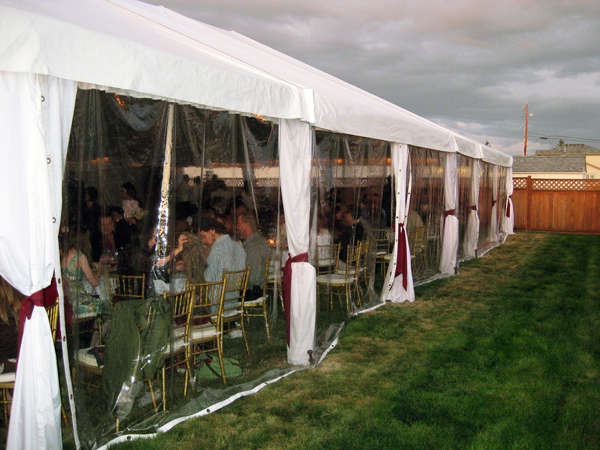 Frame tents can be anchored with weights or stakes. They are clear span inside and are the standard style used in our region by most rental companies. Pros: very adaptable, adjustable height and length, clear span, exposed framework for hanging points and décor. Can be set up on hard or earthen surfaces and can be leveled when set on sloped or tiered surfaces. When you have wide open access and space, you might want to rent a “Pole” style tent. Pole tents require stakes be pounded into the ground around the entire perimeter of the tent, in predetermined spacing (7.5′ or 10′ between legs). The stakes typically extend at least 6′-8′ off each side pole of the tent with a rope or ratchet attached to each. Pole tents have center pole to hold them up. The pole tops offer a clean smooth underside and dramatic site lines from outside. Pole tents require a site that can be staked; earthen or even some asphalt sites can be accommodated. Pros: Less expensive, pleasing exterior sight lines, clean taught vinyl underside, elegant swooping lines, vaulted ceiling feel. Cons: Stake lines around tent, center pole can be an obstruction, requires 6′ – 8′ buffer around the entire tent for staking. “You never get a second chance to make a first impression!” So why not start with an Epic beginning? The Epic Designer pole tent is eye catching with it’s 19′ – 23′ tall swooped tension, and sculptured cut of the tent tops presents dramatic sight lines and wonderful photo backdrops. This elegant tent provides a vaulted ceiling feel inside and can be lighted, heated, enclosed and floored. The unique design draws attention to any event; yours will be no exception.